2017 marked an interesting but generally neglected anniversary. Exactly 10 years ago Irish guitarist Gerry Leonard was collaborating with Roger Waters, his guitar work featured prominently on the incredibly undervalued track Hello (I Love You), part of the soundtrack to the movie 'The Last Mimzy' and of Waters' limited recorded catalogue in the 25 years between 'Amused to Death' and 'Is This The Life We Really Want?'. Leonard's work with Waters continued beyond that: the following year he was part of the team of prominent musicians that recorded The Child Will Fly with him to help support Fundacion Alas, an organization that provides aid to children in Latin America. This decennial event in music history is among those that went unnoticed in 2017 (to a degree) based on the scale of the milestone it marked – but it is a milestone that added Leonard to a roster of guitarists that includes David Gilmour, Jeff Beck, Eric Clapton, Dave Kilminster, Andy Fairweather Low, Steve Lukather, Tim Renwick, G.E. Smith, and Snowy White, among others (more recently, guitarists Gus Seyffert and Jonathan Wilson). Leonard is best known, however, for his work with David Bowie. His live shows as Spooky Ghost (his solo band since 1996) encompass a blend of Ghost material (spanning two albums to date; the band is on deck for a third one, according to Leonard) and a lot of the work he did with Bowie. Last week, his final 2017 show in his New York City lair, Rockwood Music Hall, was no exception. But all of Leonard's performances at this venue (usually scheduled between his larger tours with the likes of Suzanne Vega and Duncan Sheik: New York is now home for Leonard), are exceptional and leave you thirsty for more. Anyone with an appreciation for Waters' work and for the contributions of the many great guitarists he has partnered with should dive into Spooky Ghost's material and Leonard's live work: they will understand why Leonard stands out among these collaborators and why these milestones matter as an opportunity to appreciate an artist’s work outside the material we are most familiar with. At Rockwood Music Hall, Leonard performs as Spook Ghost solo – no backing band – yet the sounds he creates with his guitar are so full and vast that the performance transcends the scale of the production the audience can see. The simultaneously epic, haunting, and atmospheric orchestration Leonard constructs by himself puts him in a league of his own as a guitar player. 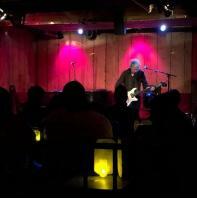 Historically speaking, Leonard's guitar sound and style blended into Bowie’s seamlessly and his performances at Rockwood Music Hall are, in many respects, a haunting tribute to the ghosts of Leonard's past – boasting a heavy Bowie presence throughout and particularly since his death in early 2016. His work with Waters 10 years ago, by contrast, was a mix of the style and tone that dominate Spooky Ghost and Leonard’s Bowie material foundationally but with a very strong shade of Pink Floyd, i.e., filtered through the prism of Gilmour's own bluesy, melodic approach. It could be argued that Leonard's guitar work on Hello (I Love You) contributed to it sounding much closer to Pink Floyd than anything Waters had (and has) done as a solo artist so far. After a prelude, Leonard begins the evening's musical journey with Pray-er, an emotive track from Spooky Ghost's self-titled 1999 album, immediately setting the mood that will prevail throughout most of the night. Leonard follows that track with the jazzy and bossa nova-hued All That Beauty, a real treat when he is accompanied by singer-songwriter Pamela Sue Mann, who in her own right navigates an ethereal and atmospheric musical landscape as a recording and performing artist. Beauty briefly departs from the mood set by the previous track, but by the time he dives back into Spooky Ghost's first album with a performance of the instrumental The Getaway the set returns to the musical vibe that will frame most of this set. An uplifting composition that allows Leonard to showcase his unique style, Getaway builds up to comprehensively demonstrate the infrastructure of Leonard's live playing. The delivery consists of a precise and complex set of recorded loops. His guitar rig fills the room with the same vigour and complexity an entire band would. By putting each part he plays on a loop one piece at a time he creates layers of guitar sound and orchestrations that turn Leonard into a one-man-band: not in a strict sense, but in a more surreal one. Leonard ushers the set through new material with performances of Water, the instrumental Day One, and Learn Not; the latter is a duet with singer Michael Brunnock. This part of the set gives the audience some insight into the musical direction Leonard is moving in. His duet with Brunnock underscores an increasingly haunting yet bright style that allows his guitar to wail through a wide variety of musical space textures, giving the audience some insight into how the next Spooky Ghost album will reflect Leonard's own evolution as a musician. Of all his performances at this venue over the course of this year, this is the one that points toward a new project the most, with that entire sequence of songs on the set giving the clearest glimpse of a forthcoming endeavour and of a pivot point in Leonard's own musical plane. The venue, which is full to capacity, is enraptured by Leonard's new tracks – a clear sign of how strong the material is and of its potential in any forthcoming Spooky Ghost project. With the audience's full attention, Leonard moves on to a track that has always been a climax in his sets no matter its production order. This also happens to be the only track he plays from the second Spooky Ghost album, Light Machine, which Bowie described as "quite the most beautiful and moving piece of work I have possessed in a long time." The track, Start Again, always transports his audience to a different place: it elicits both a sense of peace and a sense of anticipation. Two great versions of this song exist in studio form: Spooky Ghost's on Light Machine and a cover by Duncan Sheik on one of his albums featuring Leonard, Daylight; this is a song that is bound to transcend the artist and time. With its remarkable lyrics ("Save yourself, don't save me, save the one you may be, let it be the best that it can be, start again…"), the track seems to always strike a visceral chord with audience members. On this high, Leonard closes the set paying tribute to Bowie with an exquisite version of Andy Warhol. He notes Bowie's absence and alludes to his spectre… it is the audience's musical séance moment. And just like that, Gerry Leonard closes 2017 out after a combination of successful tours and a series of intimate shows at Rockwood Music Hall scattered between those tours, his work ten years prior with Roger Waters but a footnote though not forgotten. (In this setting, Leonard will indulge any fan's questions about his experience with Waters). The older we are the shorter each time-span of 10 years becomes. Catching Leonard at this intimate venue is quite the musical gift. Maybe someday the melody of Hello (I Love You) may work its way into the set. It will be interesting to see what Leonard has planned for 2018 and what milestones we may be making note of 10 years hence. In the meantime, Leonard wishes the audience a Merry Christmas and Happy New Year as they disperse into New York City's holiday-lit streets. You can read more about and follow Gerry Leonard at gerryleonardspookyghost.com. You can follow Pamela Sue Mann and Michael Brunnock at facebook.com/pamelasuemann and michaelbrunnock.com, respectively. For a trip down memory lane to 10 years ago, check out The Last Mimzy’s archived website at web.archive.org and Gerry Leonard’s work with Roger Waters on Hello (I Love You) at these two links youtu.be/M0fAB4jKJ38 (for higher quality audio and the full length version of the song) and youtu.be/1eK6FY4Hykc (for the official music video). Our thanks to Marie Lopez for the picture of Gerry in action.